Bardo Thodol. Image Source: Buddha Channel. A review of a 2011 scholarly study of translated Tibetan texts recently caught my eye. 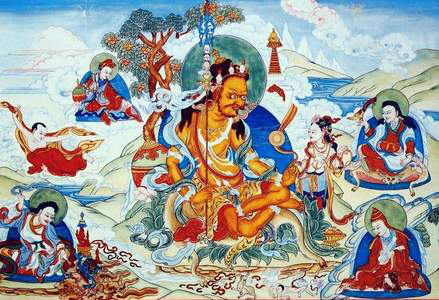 The study concerns the so-called Tibetan Book of the Dead, which focuses on the liminal or intermediate state between life and death and is a seeming spiritual guide for passing from the mortal life into the immortal realm of the Underworld. The Tibetan Book of the Dead is the most famous Buddhist text in the West, having sold more than a million copies since it was first published in English in 1927. Carl Jung wrote a commentary on it, Timothy Leary redesigned it as a guidebook for an acid trip, and the Beatles quoted Leary's version in their song "Tomorrow Never Knows." More recently, the book has been adopted by the hospice movement, enshrined by Penguin Classics, and made into an audiobook read by Richard Gere. Yet, as acclaimed writer and scholar of Buddhism Donald Lopez writes, "The Tibetan Book of the Dead is not really Tibetan, it is not really a book, and it is not really about death." In this compelling introduction and short history, Lopez tells the strange story of how a relatively obscure and malleable collection of Buddhist texts of uncertain origin came to be so revered--and so misunderstood--in the West. Lopez takes us not to the gates of Lhasa, but instead to 19th-century New England where we find that all-American holy man, Joseph Smith, in conversation with the angel Moroni. To make a long and amusing story short, Smith receives from the angel a sacred text "inscribed on plates of ore," along with a pair of the special spectacles he'll need to decipher them. Lopez is the most artful of writers; there is no flab in this short book. Hidden texts and American spirituality, we come to see, are central to the story he tells about the life of Evans-Wentz's "Tibetan Book of the Dead." Like the plates of ore on which "The Book of Mormon" was, according to Smith, inscribed, the texts from which Evans-Wentz made his "Tibetan Book of the Dead" had been purposefully concealed until those who were destined to reveal them emerged. They were, as Lopez puts it, "time-release revelations." Evans-Wentz, "a great collector of texts in languages he never learned to read," was not the finder of the time-release revelations that became his signature work — he never visited Tibet — but they made their way to him and, with help from "the English teacher of the Maharaja's Boarding School for Boys in Gangok," a Tibetan called Kazi Dawa-Samdup, he read them not through the eyes of one steeped in and respectful of Tibetan religion and culture, but through the eyes of one formed by the arcana of the Madame Blavatsky's Theosophical Society. Among the wisdom that Evans-Wentz imbibed during his time as a Theosophist is the notion that "Atlantean masters called mahatmas or great souls ... had congregated in a secret location in Tibet," a place which, in the words of one of Blavatsky's disciples "is quite unknown to and unapproachable by any but initiated persons." Just as Madame Blavatsky had to translate the texts she received from mahatmas in Tibet (they were written in the secret Senzar language), so it was necessary for Evans-Wentz to interpret his Tibetan texts in ways that would make them congruent with his theosophical beliefs. "It almost seems," Lopez writes, "that Evans-Wentz ... could have randomly chosen any Asian text, and he would have produced some version of the book he published in 1927." What makes Lopez's biography of Evans-Wentz's book not only amusing (as it unfailingly is) but enlightening is that one suspects he too could have "chosen any Asian text" that had been ripped from its context and composed a similar story of how meanings, willy-nilly, had attached themselves to it. You can read Evans-Wentz's 1927 translation for free online here.